Audi’s mooted hot-ish Q2 SUV has arrived. The new Audi SQ2 is now the quickest model in the range and comes with some tasty performance bits and pieces. 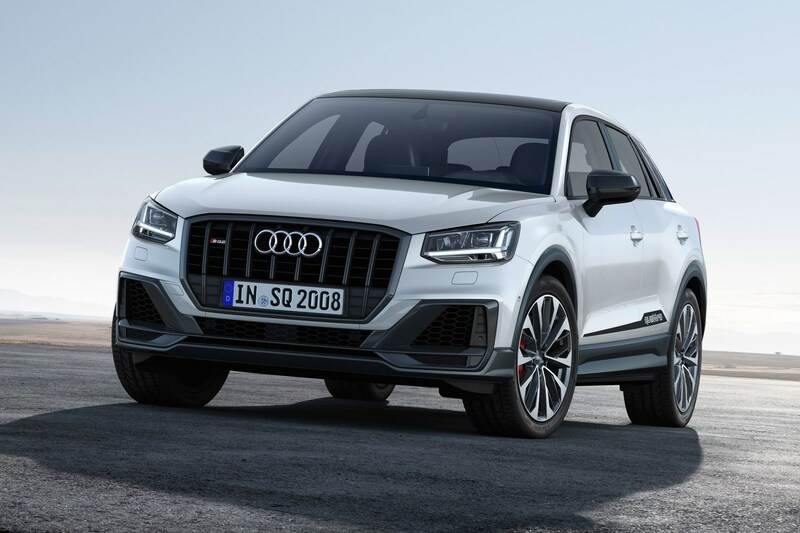 After spotting it numerous times thundering around the Nürburgring among other places during its testing phase, Audi has confirmed the new SQ2 will be among the brand’s 2018 Paris show stars. It'll also share much with the Volkswagen T-Roc R expected by the end of 2018. So, the SQ2 uses the same engine as the pokey S3: a 2.0-litre 4cyl turbo cranking out 296bhp and 295lb ft, sent to all four wheels via a seven-speed S tronic gearbox and quattro all-wheel drive. To help handling, Audi has also specced the SQ2 with ‘S-specific’ steering and a sports suspension setup that’s 20mm lower than standard. There’s naturally a performance bodykit, too, with a more pronounced front splitter, four exhaust pipes – as is the standard for an Audi S car – and optional red brake calipers. Alloys are 18 inches as standard, 19s are an option. Inside, new details include optional leather/Alcantara-mixed sport seats with embossed S logos, metal pedals, and a sports steering wheel. As with most Audis, upgrades include a Bang and Olufsen stereo, Virtual Cockpit, head-up display and more. You’ll see it first at the 2018 Paris motor show, with orders opening late in 2018. First UK deliveries will arrive early 2019.